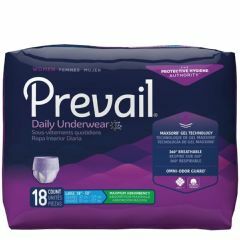 The Prevail Underwear for Women has maximum absorbency for day and night that provides the look and feel of real underwear. Anatomically designed just for women with a form fitting shape, discreet thin core and stretchable, breathable waist panels for a more comfortable fit. Super absorbent advanced core design and fast absorbing QUICK WICK™ strip rapidly locks away moisture and odor for improved product performance and wearer comfort. The soft, stretchable, clothlike back sheet provides an incredibly secure and comfortable fit. Ventilated panels allows air to freely migrate to the wearer, improving skin health and comfort by reducing heat build up. Odor Guard™ protection helps prevent odors from forming. Not as thick as previous version, but more comfortable; effective. After extended time, lining seems to separate and bunch up, negating ability to contain urine leaking.